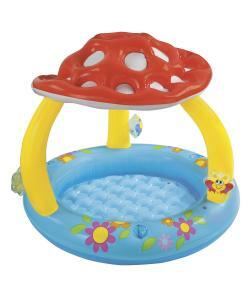 Mushroon Baby Pool Colorful exciting baby pool to keep them cool on hot summer days. The floor is very comfortable due to the inflatable waffle texture. Colorful graphics are printed on both sides to excite your little one and comes with an adorably cute large colorful mushroom sun shade overhead to shield your baby from the hot and glaring sun. Included are colorful fun little mushrooms and friendly butterfly. It can be filled with up to 13 gallons of water to keep baby cool.